In small pot on stove, melt 1/2 cup butter. Add 1 teaspoon of poultry seasoning and the zest and juice of one lemon. Set aside. Wash the turkey inside and out. Remove giblets from cavity and pat dry inside and out with paper towel. Place in roasting pan. Liberally salt the turkey inside and out. Sprinkle with pepper to taste. Gently peel up the skin over the breast from the neck end. You should be able to peel up about 2 inches of skin using your fingers. Now work the last 2 tablespoons of unmelted butter under the skin over the breast meat. Cut the second lemon in half (do not peel). Peel the onion and cut into quarters. Peel the carrot and cut into quarters. Cut the celery into quarters. Now stuff the halved lemon, onion, carrot and celery into the turkey cavities. (it’s the moisture steaming up from these vegetables that keeps the breast so tender). Close the cavity using a needle and string or turkey skewers. TIP: By now you’ve probably noticed that there is no room to stuff the turkey 😉 While stuffing made inside a turkey does get that added bit of flavour, for food safety reasons, most experts recommend you don’t cook stuffing inside the bird. We always cook our stuffing separately and it too is always full of flavour. (Click here for the recipe) Added bonus: no getting up 2 hours earlier to make the stuffing. It can be done the day before and reheated for dinner. Brush the outside of the turkey with the melted butter mixture. Cover and bake for 15 minutes per pound or until the breast meat registers 175 degrees or the juices from the dark meat run clear. TIP: There is always a debate over whether you should cover a turkey or not while roasting. I have always covered the bird and removed the lid from the roaster for the last half hour to 45 minutes to brown the skin. Admittedly, my turkeys do not have that beautiful golden brown toasted colour that you want if you are slicing and serving at the table. We serve the turkey sliced so it’s not an issue ’round here. Remove from the oven, keep covered, and let rest for up to an hour. Remove the vegetables from the cavity and discard, remove the pan juices to a pot to make the gravy (recipe here) and then carve the bird. CARVING TIP: Be sure you have a cutting board with drainage. This bird will be MOIST! We always remove the breast meat by slicing each side away from the breast bone and then cut them into neat round slices on a separate cutting board (as you would a pork loin). This method is simple, quick, and the resulting slices look great on a platter. Photo credit: “Thanksgiving” by Doris Lee. 1935. 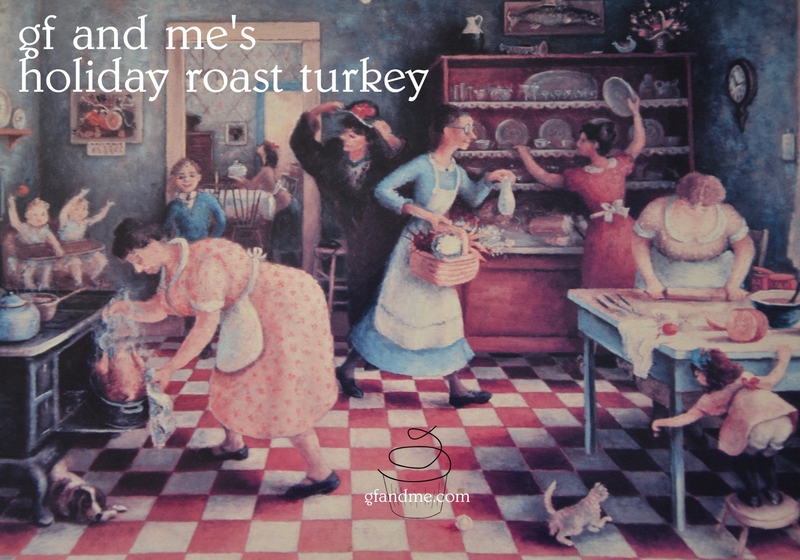 Like I said, my roast turkeys are always a bit pastey shy and don’t take well to being photographed! This entry was posted in Lunch and Dinner, Recipes and tagged Christmas, gluten free, Poultry, thanksgiving. Bookmark the permalink. I sure do love your Mom Mary’s awsome recipe for holiday turkey. and might I add her pastry as well. Yup. Figured you’d like these recipes Mary!